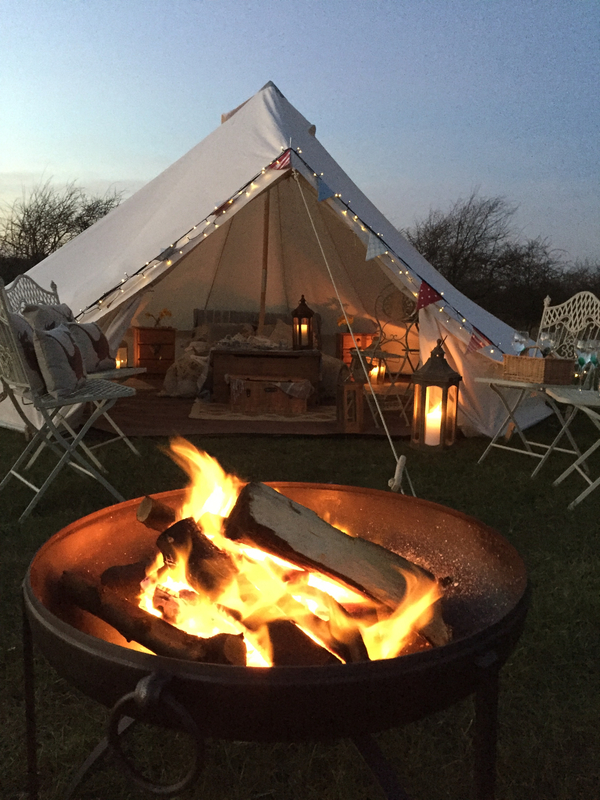 Our 5 metre bell tents are beautifully appointed with quality fabrics, carpeting, rugs, cushions, furniture and equipment. Sleep peacefully in a comfortable double bed, with quality cotton bedding and warm duvets. Extra blankets are stored in the ottoman inside the tent. Pop your holiday reading book on the bedside table, and sit comfortably at the dining tables and chairs – inside and outside your tent. Pretty scatter cushions, interior lighting and fitted floors ensure you are cosy and comfortable. Essentials include tea, coffee, condiments, crockery, cutlery, pans, and of course a kettle. Our bedding is professionally laundered to ensure our linens are always crisp and clean. We also provide bath towels. Enjoy evenings watching the amazing sunsets, or gazing at the stars from beside your campfire or barbecue – supplied with a basket of logs, firelighters, and kindling. Exterior lanterns and bunting complete the evening outdoor atmosphere. As an optional extra for protection from sunshine and rain you can rent an additional awning. Waitress delivery to your tent, breakfast is served on china plates with linen napkins. Please contact us about any special dietary requirements – we are happy to help.